with historic appeal and a premier location in Old Town! 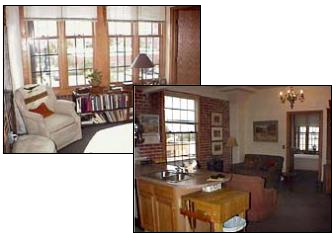 The "true loft" apartments keep the building's 17 foot high ceilings, exposed mechanical pipes and sprinklers, and oversized windows. They take advantage of the eight-inch-thick concrete floors, which provides a high level of sound proofing. Innes Station includes two-story loft-style apartments on the first level, outdoor patios in some units, two passenger elevators, and secured underground parking. Built in the 1920's and used by the Yellow Cab Company, the Mosley Street Place Loft Apartments feature 12 different floor plans, large walk in closets, 750 - 960 square foot units, full aplianced kitchens, imaginitive open floor plans, laundry rooms on each floor, 1 & 2 bedroom apartments, fire sprinkler system double pane windows with mini blinds, high 9 foot ceilings, and historic views of Old Town.